We’d love your help. Let us know what’s wrong with this preview of Second in Command by Sandi Van. To ask other readers questions about Second in Command, please sign up. This book talks about what happens when one of the parents on a household leaves with the army, how the rest of the family deals with it and tries to carry on a normal life even though they know there is a vital member of the family missing. The gem of Second in Command is my precious main character, Leo. This boy had the most pure intentions I've read, his only desires were to protect his siblings and help his community to be more tolerant and safe for everybody. On top of that he had to go through so many awful things and make difficult decisions which made him more real and complex. Then we have Leo's brother, Jack. This kid felt even more real than Leo but he didn't have the same mindset as his brother and that's were they difference. I actually loved him too, I think it was mainly because I understood where his decisions came from and it also helped that we got to know him through Leo's eyes and they just have so much love between them that it was hard not to feel the same way. The only thing I didn't like were the parents and their decisions, I don't want to get too into it because it's a very personal thing but if I had been these kids' parents, I would have made sure to be present for them and actually take care of their needs no matter how I was feeling or what I wanted because children always come first once you have them. But again, it's personal and I also think if these parents had done things my way, this book wouldn't exist and that would be tragic. "School is where you go to feel safe but what happens when it becomes a place of fear?" this book is so timely with everything that's been going on, especially with this quote. It really spoke to me and touched my heart. This book was super easy to read and super easy to understand, it really got it's message out there and I adored it! I can't wait till more people are able to read this fantastic story. I'm supposed to write a coherent review but all I had for 98% of the book was: F#ck. That's all I could get because this book just kept punching me in the gut, not letting me breathe. Like damn, can you let a person breathe Sandi Van! And then that ending. Like punch me in the gut and then rip my heart out. But then pat it softly coz ugh, that ending! UGH! This book is full of beautiful writing and definitely packs an emotional punch. It's in verse, and you'll find that it's short--that's on purpose. It's meant for struggling readers who need higher level content. But it would also be enjoyable for other kids, and adults! It broke my heart and put it back together again on every page--in a good way. Highly recommend. This was incredibly well written and I read it early this year before it was officially released. The characters are relatable and I will definitely use with my struggling readers - especially 11th graders and ELLS. Compulsively readable! This book is an honest picture that touches on many issues facing teens today. Good book for striving readers; engaging story told in an easy to read format. Not what I expected ! When I received this I had no idea it was in verse, nor how short it was. So this review (and the 5 stars) is written from my inner (middle grade/junior high) child's point of view (probably 3 stars from an adult version of myself) . It was an easy read, easy to understand and it most definitely knows how to get a strong message across ! Perfect for those young ones looking to get into reading. Thank you to NetGalley and Sandi Van for the ARC in exchange of an honest revi Not what I expected ! When I received this I had no idea it was in verse, nor how short it was. So this review (and the 5 stars) is written from my inner (middle grade/junior high) child's point of view (probably 3 stars from an adult version of myself) . It was an easy read, easy to understand and it most definitely knows how to get a strong message across ! Perfect for those young ones looking to get into reading. A special thank you to Netgalley and West 44 Books for a free advance digital copy in exchange for a honest review. I love verse novels and the raw emotions explored in this one make it a definite 5 star read. Leo is the eldest child and left mostly in charge of his younger siblings when his mom deploys and his father works. The emotions are very strong and really well explored, as Leo tries to balance his own needs and desires with his o Check out this review and others at my blog Too Many Books! I love verse novels and the raw emotions explored in this one make it a definite 5 star read. Leo is the eldest child and left mostly in charge of his younger siblings when his mom deploys and his father works. The emotions are very strong and really well explored, as Leo tries to balance his own needs and desires with his obligations to his family. He has to face a lot and while his actions are shown that he puts forth a strong front, he is struggling underneath. While I have not been in the same circumstances as Leo, the emotional whirlwind that he goes through is described very well, making this book packing a punch for such a short book. In verse novels, often many components of books are left out in favor of the poetry, but this verse novel had a few really good subplots. Not enough to overpower everything else, but enough so that it was actually a verse novel and not just themed poetry. The pace suited with the medium and while Leo's thoughts and emotions were definitely explored, it did not overpower everything else and the plot was able to keep on moving forward. There were a few descriptions of the Leo of the past that were really cool and added more to his character without detracting from moving the story forward. I wish that there was just more to the interactions between Jack and Leo, and to the end of the story. While the ends were wrapped up, the ending just felt like it was lacking something, not having the satisfaction level that I was expecting at the end of this read. It also seems unrealistic in some of the supporting structures of what allowed the plot to move forward. Excellent book. The poetic structure really helps to convey the emptiness and pressure that Leo feels when his mother is deployed. It's amazing how much character development is conveyed in so few words, the warmth of the family, the unsaid tension between father and son, etc. The verse format makes this book accessible for teens who struggle with reading with a fascinating story they can relate to. Definitely would recommend to teens and adults. This book is solid, sincere, and strong from start to finish! Sandi Van's poetry feels as natural as the beats of Leo's running feet, and the heartstrings of this story keep pulling the reader from one page to the next. Leo walks the line of being a thoughtful, honorable protagonist, while Van's well-wrought angst keeps him from falling into do-gooder territory, and the plot is tight and deftly managed. Highly recommend, especially for readers who benefit from fewer words on the page. I really enjoyed reading this book. Leo was such a strong main character. I loved how we got see how he handled the responsibilities of being the oldest child and how he dealt with his mom being deployed. And the ending was just the perfect way to finish the story. 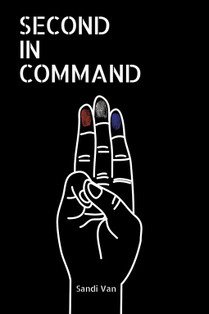 Second In Command is a very easy and quick read which tells an emotional story that many military families can relate to. Very creative and highly recommended for young adults!! Really good book. Would recommend. It being written in verse makes it a breeze to get through. And it still manages to convey the feelings of family, loss, loyalty, confusion and commitment that a teen in these situations may face. It's a quick snapshot but it gives a good picture. This is listed as a book for reluctant readers and I get why. I think it's a great starter for someone who finds reading to be daunting or uninteresting. A great novel in verse for middle school and junior high! I can’t wait to share it with my 7th graders. It’s amazing how prose can convey such a beautiful story. What a talent to be able to pick the perfect words in the perfect sequence and affect your readers so intensely. Verse novel. Mom is deployed, dad has to work long hours and Leo, our narrator, is pushed into a caregiver role for his younger brother and his baby sister. When his younger brother makes a poor decision, Leo is forced to wonder what happened and if he could have done better. Quick read. Solid without being cheesy.